By reading these MVC interview question it does not mean you will go and clear MVC interviews. The whole purpose of this Post is to quickly brush up your MVC knowledge before you for the MVC interviews. Before Going for Question Answers, i will give you a little bit of introduction about MVC. MVC is a framework pattern that splits an application’s implementation logic into three component roles: models, views, and controllers. Controller: Handles a request from a View and updates the Model that results in a change of the Model’s state.To implement MVC in .NET, we need mainly three classes (View, Controller and the Model). A route is a URL pattern that is mapped to a handler. The handler can be a physical file, such as an .aspx file in a Web Forms application. Routing module is responsible for mapping incoming browser requests to particular MVC controller actions. 1. What are the 3 main components of an ASP.NET MVC application? 2. In which assembly is the MVC framework defined? 3. Is it possible to combine ASP.NET webforms and ASP.MVC and develop a single web application? 4. 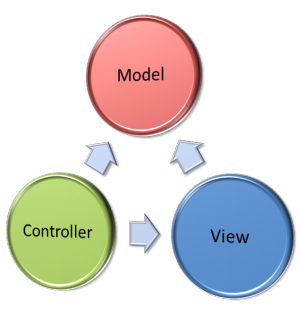 What does Model, View and Controller represent in an MVC application? Model: Model represents the application data domain. In short the applications business logic is contained with in the model. View: Views represent the user interface, with which the end users interact. In short the all the user interface logic is contained with in the UI. Controller: Controller is the component that responds to user actions. Based on the user actions, the respective controller, work with the model, and selects a view to render that displays the user interface. The user input logic is contained with in the controller. 5. What is the greatest advantage of using asp.net mvc over asp.net webforms? It is difficult to unit test UI with webforms, where views in mvc can be very easily unit tested. 6. Which approach provides better support for test driven development – ASP.NET MVC or ASP.NET Webforms? 7. What are the advantages of ASP.NET MVC? 1. Extensive support for TDD. With asp.net MVC, views can also be very easily unit tested. 3. Seperation of concerns. Different aspects of the application can be divided into Model, View and Controller. 4. ASP.NET MVC views are light weight, as they donot use viewstate. 8. Is it possible to unit test an MVC application without running the controllers in an ASP.NET process? Yes, all the features in an asp.net MVC application are interface based and hence mocking is much easier. So, we don’t have to run the controllers in an ASP.NET process for unit testing. 9.Is it possible to share a view across multiple controllers? 10. What is the role of a controller in an MVC application? The controller responds to user interactions, with the application, by selecting the action method to execute and alse selecting the view to render. 11.Where are the routing rules defined in an asp.net MVC application? 12. Name a few different return types of a controller action method? The following are just a few return types of a controller action method. In general an action method can return an instance of a any class that derives from ActionResult class. 13.What is the significance of NonActionAttribute? In general, all public methods of a controller class are treated as action methods. If you want prevent this default behaviour, just decorate the public method with NonActionAttribute. 14. What is the significance of ASP.NET routing? 15. What are the 3 segments of the default route, that is present in an ASP.NET MVC application? 16. ASP.NET MVC application, makes use of settings at 2 places for routing to work correctly. What are these 2 places? 17.What is the adavantage of using ASP.NET routing? An ASP.NET web application that does make use of routing, makes use of URLs that do not have to map to specific files in a Web site. Because the URL does not have to map to a file, you can use URLs that are descriptive of the user’s action and therefore are more easily understood by users. 18. What are the 3 things that are needed to specify a route? 1. URL Pattern – You can include placeholders in a URL pattern so that variable data can be passed to the request handler without requiring a query string. 2. Handler – The handler can be a physical file such as an .aspx file or a controller class. 3. Name for the Route – Name is optional. 19. Is the following route definition a valid route definition? 20. What is the use of the following default route? 21. What is the difference between adding routes, to a webforms application and to an mvc application? 22. How do you handle variable number of segments in a route definition? 23. What are the 2 ways of adding constraints to a route? 24. Give 2 examples for scenarios when routing is not applied? 1. A Physical File is Found that Matches the URL Pattern – This default behaviour can be overriden by setting the RouteExistingFiles property of the RouteCollection object to true. 2. Routing Is Explicitly Disabled for a URL Pattern – Use the RouteCollection.Ignore() method to prevent routing from handling certain requests. 25. What are the 2 popular asp.net mvc view engines? 26. What symbol would you use to denote, the start of a code block in razor views? 27. What symbol would you use to denote, the start of a code block in aspx views? Check whether an email address is valid or not ?